Electric bikes are a rapidly growing area of the bicycle industry, offering the promise of effortless two-wheeled travel. Professor Mark Miodownik of University College London tests a Smart E-bike (pictured, above) as part of an in-depth look at e-bike technologies, for both utility and recreational riding. 3. Were there any lasting consequences? Touring tip #3: Pump me up! As a young cycle tourist in the late 80s and early 90s I used to get a lot of punctures. Fortunately, at that time the charts were full of tunes featuring lyrics about pumping this or that up and I was able to pass the time while fixing punctures by singing them to myself. These days, the recording industry seems a lot less occupied with pumping stuff up. This is because good quality modern bicycle tyres mean that we’re all getting far fewer flats. Yet a puncture remains a minor inconvenience for which every bicyclist should be prepared. Commuter cyclists can always jump on a train or hail a taxi to get home, but if you’re touring, you’re on your own. Besides a couple of spare tubes and a repair kit, it is definitely worth carrying with a good pump so that you can get your tyres back up to the correct pressure. A minipump is a nice thing to find inside a Christmas cracker but you will find it very hard work to inflate your tyres to anywhere near high enough pressure using a minipump. The best pump for the touring cyclist is a frame mounted pump. 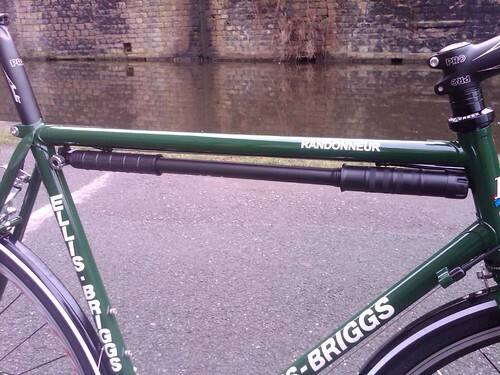 Because it’s mounted securely on the frame, it’s always right there so you can keep your tyres topped up as necessary and it frees up some space in your bags for carrying flapjacks. The best frame pump is made by Zefal. It’s the HPX model, made from aluminium, not flimsy plastic. It can reach a tyre pressure of 160 psi. As a touring cyclist you will never pump your tyres to anywhere near such a high pressure, but it’s good to know you’ve a pump with plenty of power in reserve. In the unlikely event that any part of the pump breaks, replacement parts are available. He said not the first time during my visit that he was not a rich man in the monetary sense but had a wealth of happy memories and good health to show from his racing exertions. He still rides a lot, is at most of the touring rallies in the Parisian area, but likes to take it easy. ‘I have suffered enough on a vélo,’ he said, but last year he did 115 miles in 8½ hours, with 12lb of luggage, stopping 10 minutes every two hours to eat biscuits, pears and grapes and drink a glass of Vichy water. The Zefal HPX comes in four sizes for different sized frames. Make sure you get the right one. At £20 this pump is less than half the price of a bottle of vintage champagne and less than a quarter of the price of certain other top end pumps. It’s a bargain.